Although wine drinking is a common cultural heritage enjoyed by various peoples world-wide, the wine drinking culture of each people is different. The origins of fermenting and drinking wine in China go far back in time. Our Chinese ancestors either used wine as a libation to their forefathers to express reverence, or to enjoy by themselves while writing poetry or prose, or to toast their relatives and friends during a feast. Without a doubt, wine occupies an important place in the culture and life of the Chinese people. 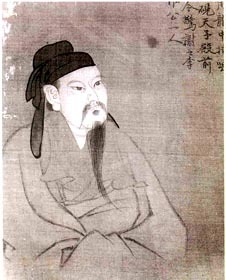 Wine was intimately connected with most Chinese men of letters. It was also an inseparable part of the life of ordinary Chinese people. The banquets of ancient emperors and kings could not take place without it. Every sort of wine vessel thus became an important kind of sacrificial object. There are many Chinese historical accounts of literati, poets, and knights of the medieval Wei, Chin, and Tang dynasties who were hearty drinkersone of the various connections between wine and Chinese culture worthy of note. We may also infer an intimate connection between the academic thinking and social practices of the time. 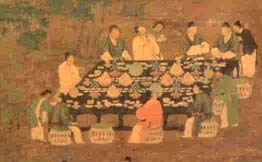 Although this relationship between Chinese intellectuals and wine did not originate in the Wei and Chin dynasties, we can not ignore the fact that wine occupied a prominent place in, or even; accounted for almost all of, the lives of the Seven Sages of the Bamboo Grove, a group of well-known literati of the Chin dynasty. 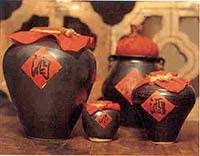 The traditional Chinese rice wine, called Shaohsing, is made by fermenting sweetened glutinous rice or millet. This Chinese invention dates from the 3rd century B.C., and it also contunues to be popular today, under a number of different brand names, such as Chia Fan, Hua Tiao, Yen Hung, and Hsiahg Huseh. In Chinese, there is only one word for both wine and spirits: Chiu. That covers the dry sherry-like shaohsing and the white Kaoloang, which resembles gin or vodka, and ultimately includes the notorious Mao-Tai. Reaching a potency of 150 proof, Mao-Tai can knock your socks off.At a formal Chinese banquet, it would be drunk straight, with no water or ice to dilute its flavor. The Chinese Drink their wines at dinner, with food, rather than before dinner. 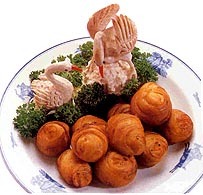 If you are ar a Chinese banquet, and if it's your turn to toast the host, raise your glass and say, "Kan Pei!" That means, "Bottoms up." If you are invited to a banquet among North American Chinese, you may be surprised to find that whiskey or brandy has replaced rice wine as the Chinese alcoholic beverage of choice.